Gary T. Erbe was born in 1944 in Union City, NJ where he maintained his studio for 35 years. Self taught, he began painting in 1965. In the early years, every painting Erbe created would become a learning experience bringing him closer to understanding what makes good art. This was a challenging time for him. Then he discovered and became interested in Trompe l’oeil painting. In 1969, he conceived a way of creating Trompe l’oeil paintings that would be contemporary and different from the 19th Century Trompe l’oeil masters and coined the term “Levitational Realism”. In 1970, he quit his job as an engraver to pursue art fulltime and in the mid 1970’s, he began to explore the idiom of abstraction and cubism and how it can be applied to Trompe l’oeil painting. The idea of integrating modern principles into his painting was very challenging and exciting. Bridging the gap between modern art and realism would be his vision. 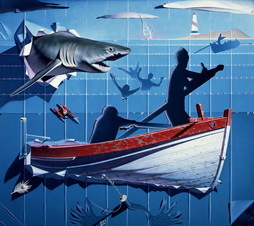 In fact, today his work has less to do with Trompe l’oeil and more to do with the creative process. Erbe’s work is the creation of a synthetic sense of space derived from the combination of flat space integrated with abstract forms exaggerated and enhanced by shadow, light and color. Mr. Erbe has exhibited extensively throughout the world and has garnered many awards for his paintings. Gary T. Erbe served as President of Allied Artists of America, Inc. from 1994-2005. To see Gary’s work available for reproduction click here! Saturday, September 23th, 2017 at the tennis courts at YSU. Registration 9-9:45 a.m. 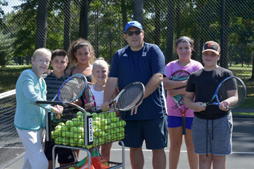 Tournament begins at 10 a.m. Doubles (Men, Women, Mixed) Play. Singles Play. Entry Fee: $200 for a team of 4. Call 330-744-4269 for any questions. 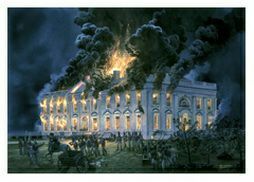 Under President James Madison’s watch, British forces , led by Major Robert Ross, set fire to the White House on August 24, 1814, in retaliation for the American destruction of Port Dover in Upper Canada. Other buildings throughout Washington were set ablaze as well. However, less than a day later, a sudden thunderstorm struck, pouring needed water upon the flames, and thus saving the Capitol. This event became known as “The Storm that Saved Washington”! Purchase a reproduction of this piece on RequestAPrint.